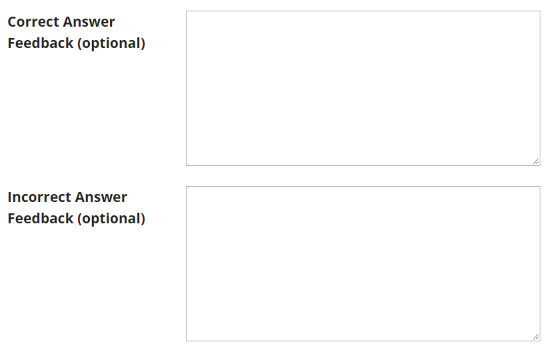 Sakai Community DocumentationSakai 19 User Guide (English) Tests and QuizzesHow do I create a multiple choice question? 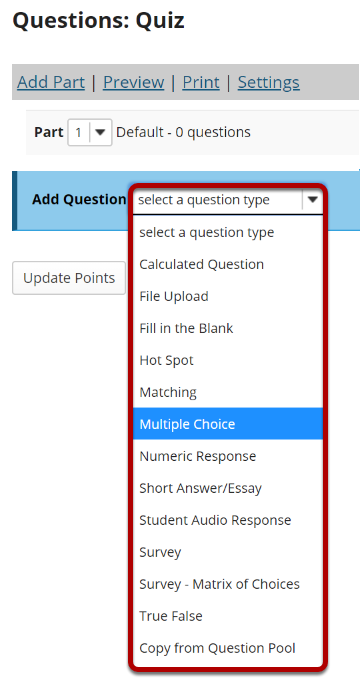 A multiple choice question in an assessment provides pre-written choices from which the student will select. 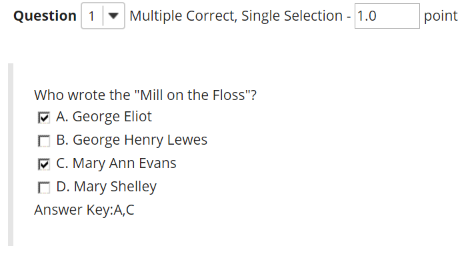 You can restrict the correct answers to one selection, or require allow multiple selections (one or more) for a correct answer. 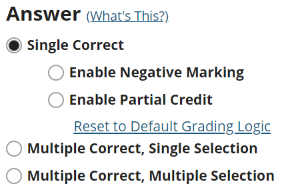 From the Add Question drop-down menu, select Multiple Choice. A single correct answer grants all of the points to that selection. Selecting that configuration reveals a field for optional designation of negative points, incurred for any single incorrect selection. A multiple correct, single selection answer grants all of the points to more than one single selection. 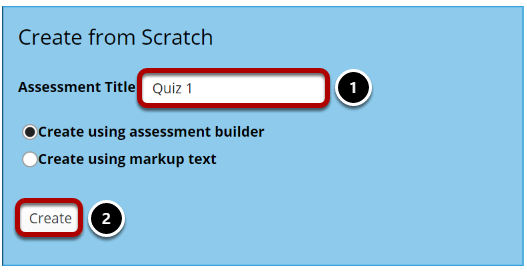 If more than one of the answer selections is correct, then each can be checked, and a student who checks either of those selections (via radio buttons) earns all of the points. An example is shown above. A multiple correct, multiple selection answer requires several selections and allows different policies for granting the points. The option Right Less Wrong means that the points possible will be reduced by each box checked wrongly, either affirmed for a selection that should not be included, or left empty for a selection that should be included in the correct answers. The option All or Nothing means that all points are granted for a fully correct answer only; any other combination of affirmed and empty check boxes earns no points. Type the question into the text box provided. Note: You may also use the Rich Text Editor by clicking on the Show All Rich-Text Editors link. 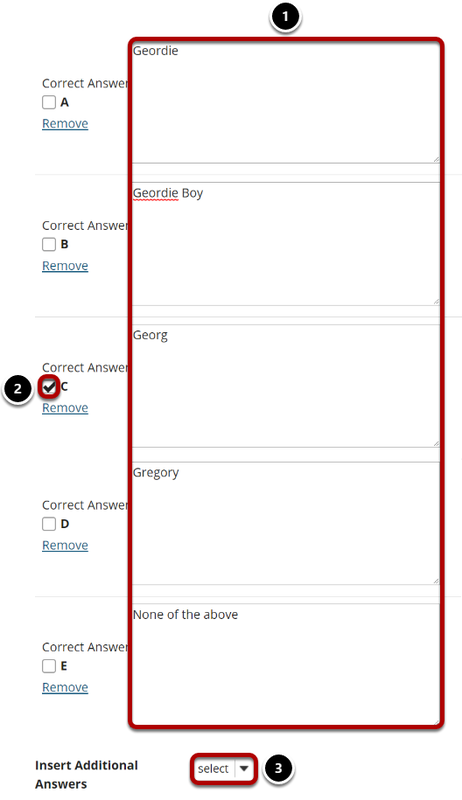 Type the answers in the text boxes provided. Indicate the correct answer by selecting the appropriate letter in the Correct Answer column. (Optional) For more possible answers, choose a number from the drop-down list Insert Additional Answers. Tip: To expand or shrink the text boxes, drag the corners. Next: How do I create a matching question?